Another great year for the Eastern Surburbs Cricket Club by winning five trophies, and the 2A Roosters in first place 2A Grade competition and retention of the Cook Shield by the Premier Men’s team for another season. Cook Shield The Premier Men’s competition that runs much like rugby’s Ranfurly Shield with clubs having to beat the holders outright over two days to win it. We have successfully defended this 21 times now. Yes the Mighty Easts have done it again and qualified for the Premier Mens Final for the Wilkinson Pearce Cup. No guessing who the opposition is - Karori for the 3rd year in a row. Easts will need an outright win in the three day final at the Basin Reserve to claim the trophy for the astonishing 10th successive year. Result was a win to Karori by 108 runs - we will get it back!!! The Club’s End of Season Prizegiving Dinner will be held at the Clubrooms on Saturday 26th March 2011 from 7.30pm. The sumptuous Buffet Dinner will be served at 8.30pm followed by Prizegiving and then the Mystery Guest! $20 per head - no exceptions, including late arrivals. I want all teams well represented. Promises to be a humdinger!!! 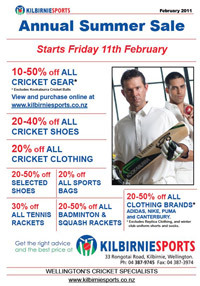 Player of the Week can be won by anyone who does something extraordinary in New Zealand sport each week. The PlaceMakers Player of the Week wins a $250 PlaceMakers voucher and last weeks winner was Lance Dry who achieved two milestones - his best bowling in an innings with 7-55 and a maiden century of 111* when batting at number 10. He also set a new club 10th partnership record of 112 with Ricky Joseph. Listen to Murray Deakers Sportstalk on Newstalk ZB yesterday afternoon when Lance was awarded Placemakers Player of the Week. History repeated in painful fashion for young Wellington & Easts opener Josh Brodie yesterday when his season was ended in the nets. A distraught Brodie was told he would be sidelined for six to eight weeks after his left index finger was broken by a short delivery from Wellington fast bowler Andy McKay at net practice. It was a broken bone in the same finger that ended Brodie’s season at a similar stage last year as he was pushing for higher honours. Lance had his career best bowling figures 7-55 and first senior century in the two day match against North City on 26th & 27th Feb 2011. The first day Lance removed the two openers and with some help from Jeetan Patel put Norths on the back foot when the scorebook changed from 0-66 to 4-67. Lance’s 1st innings bowling figures were 27 overs, 9 maidens and 7 wickets for 55 runs. Chasing 270 for first innings points, Lance joined Josh Mclauchlan (68) at the crease when the score was 238-8. Lance & Josh achieved the target of 270 and progressed to 330-9 scoring 95 runs for the 9th wicket. Other highlights in the match were Jeetan Patel’s 3-90, Josh Brodie (80) and Scott Golder (70). We are now in 2nd place in the Pearce Cup and are sniffing around with a chance for the final with 2 matches to play. The Easts club chairman and Wellington selector Doug Pollock decided to dust off the whites and team up with his 18 year old son Andrew for the two day match against Taita VIC Cycles. 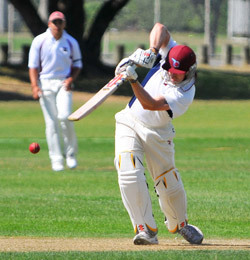 At 44 and fresh up from a spell, Doug hopes he can break his senior club century drought for Eastern Suburbs today. But a few catches off his son's bowling would do nicely instead. Match result:- Doug was just nine runs short of his maiden century for Easts scoring 91 with 14 fours but did achieve 128 runs for the match with a 2nd innings score of 37. Son Andrew picked up three wickets. Expect Josh Brodie to hit the ground running when the Plunket Shield resumes at the Basin Reserve with the Wellington Firebirds hosting the Auckland Aces. With a strong motivation to help the Wellington Firebirds rediscover their winning formula and a huge desire to play Test cricket for the BLACKCAPS, the left handed opener can’t wait to don the whites and get back into four-day cricket. Two East Premier Team players, Ricky Joseph and Niranjan Naguleswaran, have been selected to represent Wellington in the National Under 23 tournament. All three formats will be played throughout the tournament that is played amongst the six Major Associations, including one three-dayer, three one-dayers and one Twenty20 fixture. The annual Wellington versus Hutt Valley cricket match for the Stewie Dempster Shield is being played this Sunday 19th December 2010 at Fraser Park. Four East Premier Team players have been selected with Josh Brodie as Captain along with Jeremy Dean, Josh McLauchlan & Ricky Joseph. This year the match doubles as a trial match for the Wellington U23 side that will contest the National Tournament in Lincoln from 24 of January 2011. How about providing support to your fellow East players. 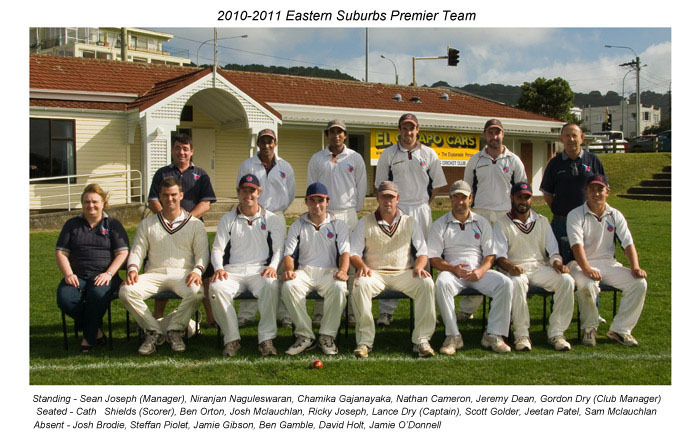 Three of the Easts Premier team are in the Wellington trial game to be played at Kelburn Park on Tuesday 30th November 2010. The four players are Jeremy Dean, Scott Golder and Jeetan Patel. Jeetan Patel will captain the Wellington Twenty20 team with Scott & Jeremy missing selection. The most successful Wellington club cricketer of modern times has hit out at the Firebirds selectors on the eve of their first Twenty20 match of the season. Lance Dry has taken 502 Pearce Cup wickets, as well as guiding his Eastern Suburbs club to the last nine titles and believes he should be in the team that will play Otago at the Basin Reserve today. "I was hoping for a chance in the Twenty20 trial [on Tuesday]," 34-year-old Dry said yesterday. "Seriously. I mean dead serious. [I’ve got] the best RPO, best average and most wickets in club Twenty20 so far this season and can’t get a trial. Honestly, I’d play tomorrow if they picked me today." The leg spinner played five first-class matches for Wellington in the 1990s and hasn’t been sighted since, despite having been a Firebirds selector in recent years. "It was never on to pick yourself," he said. "But I’ve never not been available for Wellington and I’d actually like to [play for them]. Whether everyone who does now likes to, I don’t know. "I would actually like to play for Wellington because it’s Wellington, rather than because it’s first-class cricket. I’m a Wellingtonian and I want to play for Wellington, which is a bit unusual. "It would actually be nice to see more Wellingtonians in the Wellington team." Suffice to say that Dry was not impressed when Wellington brought Victorian Jayde Herrick in for the most recent Plunket Shield match. "I would describe that as a little farcical, probably. Definitely disappointing for club guys." But with the number of selectors having swelled to five, the muddled thinking doesn’t surprise him. "I guess it’s on a par with the Black Caps having 14 guys playing cricket on the tour of India and 13 support staff. A little unnecessary." Many will remember that Dry and his club pulled a similar stunt to the Herrick one, last season, when New South Welshman Steven Spoljaric was brought in to bolster their squad ahead of the Pearce Cup final. "Yeah, but we got an Aussie in to replace an overseas player who had gone home injured. Wellington got him [Herrick] in to replace no-one." An unrepentant Dry said he still believes Cricket Wellington’s handling of the Spoljaric affair was cowardly, making their eventual win over Karori all the more satisfying. Seventeen years on and the hatred shows no signs of subsiding. On their own, the small matter of his 502 Pearce Cup wickets and the nine titles in succession would probably annoy people. But there’s just something about Lance Dry’s demeanour that means somewhere, right now, a club cricketer is bound to be talking about how much they dislike the Eastern Suburbs captain. "Most of them haven’t even met me properly, but that’s all right. It’s their time they’re wasting, not mine," Dry said this week. "But people do seem to get pretty fired up about it." Even his mates cop it on his behalf, like Easts’ lower-grade stalwart Steve Pyke. There was little in Lance Dry’s first over in Pearce Cup cricket to suggest he would go on to take 500 wickets. But that’s the milestone the 35-year-old Eastern Suburbs leg spinner reached yesterday, when he dismissed Naenae’s Damian Austin, on home turf at Kilbirnie Park. In doing so, Dry became the first bowler since Evan Gray (Karori and Johnsonville) to reach the elusive mark. 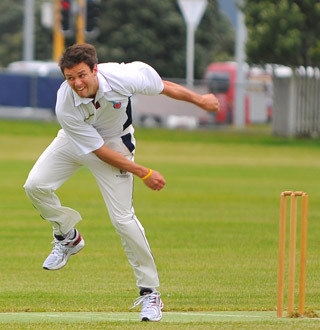 In the very first edition of a new series Club Guns on the Twenty20 website they spoke to former Wellington Firebird and current Eastern Suburbs stalwart Scott Golder about his career for both the Easts club and Wellington province. Fresh off the big bird from England, 22 year old Steffan Piolet made an immediate impact in his first game for Easts in the Pearce Cup Twenty20 game on the 23 October bowling 3 overs, one maiden and two wickets for 3 runs. He also showed his all round talent with the bat 2 days later in a one dayer making 54 runs and a partnership of 113 runs with Jeremy Dean. Steffan Piolet is an English cricketer, a right-handed batsman and right-arm medium-pace bowler who plays for Warwickshire. He was born in Redhill and is also of Norwegian descent. Having represented Sussex, Worcestershire, and Warwickshire in Second XI cricket, Steffan made his List A debut during the 2009 season, against Somerset, during the 2009 Friends Provident Trophy. He was named the county’s second XI player of the year and appeared for the top side. Steffan’s first-class debut came in June against Durham UCCE and he had an excellent game with the ball, taking ten wickets: 6-17 in the first innings and 4-26 in the second. After his first performances with Easts, Steffan is shaping up to be a fine acquisition for the club. It is with tremendous regret that we learned of the passing of Eric at the age of 99. Eric was a legend in this Club - most people will be familiar with his extraordinary sporting feats - a double "All Black" in rugby and cricket and an international referee and umpire. Eric was Patron and a Life Member of this club since the inception of the Club in 1993. His passing is a huge loss to sport in general and to this Club. It has been with deep regret that we learned of the passing of Bryan. A stalwart and a life member of the old Kilbirnie Club - Bryan threw his support behind the new Easts club following the amalgamation in 1993. Bryan was well known as a dedicated player and established an outstanding record as a long term administrator. A few years back he was often seen around the Club on a Saturday afternoon - unmistakably dapper in his collar and tie and tweed jacket - usually accompanied by a jaunty trilby or sometimes stylish cheesecutter. He liked nothing better than to corner a member in the clubrooms and relate a detailed tale of his playing days! Always with good humour and close attention to detail! Failing health meant that in recent years Bryan was not quite as regular at Kilbirnie Park. 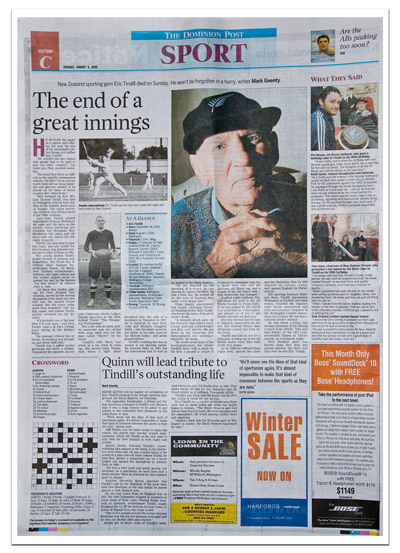 A long time member of Wellington Cricket, Bryan was also something of a fixture in the Long Room at the Basin Reserve. The Club has lost a dedicated club man and a true supporter - all members wish his family our heartfelt condolences. 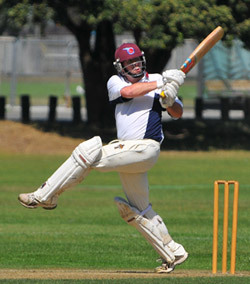 Josh was pleased to have a good bat last Saturday and score a century  for the Premier Men Easts El Cheapo Cars side. 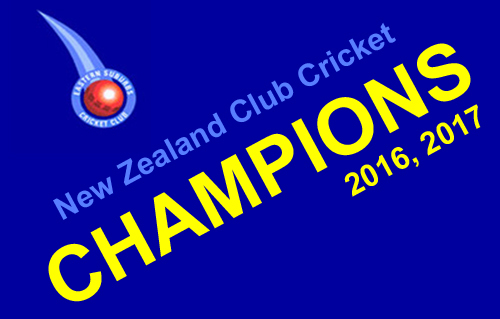 Now the time in the middle is ticked off everything feels good and I’m ready for the re-start of the Plunket Shield.